COLUMBUS — Take advantage of all the natural beauty and romance Ohio’s winter season offers by packing your bags for a getaway with your special someone or a family outing. Whether your preferences include woodsy hikes, snuggling by the fire or a rollicking toboggan run, you can Find It Here in Ohio. Start your travel planning at Ohio.org. Landoll’s Mohican Castle is a modern-day castle that creates a magical escape in the woods of Loudonville. Unwind from the busy-ness of everyday life and reconnect by booking a spa appointment. Continue to relax and enjoy each other’s company at the indoor pool, hot tub and sauna or over an amazing meal. Nearby Mohican State Park provides plenty of room to meander through the hemlock forest along the Clear Fork River. Named “Best Wine Country Hotel” by USA Today two years running, The Villas at Gervasi Vineyard in Canton are known for their prestige. Cuddle up in state-of-the-art villas with fireplaces, heated floors and Tuscan-inspired décor. Complimentary continental breakfast is included for hotel guests. Share a candle-lit dinner at The Bistro, complete with gourmet Italian dishes and specially paired Gervasi wines. While in the area, check out the Pro Football Hall of Fame or Canton Museum of Art. While Maumee Bay State Park Lodge in Oregon is a great family getaway, it’s also a hidden gem for couples. Each room has a private balcony, and the lodge features three large fireplaces perfect for cozying up next to your sweetheart during the cold winter months. If you’re looking for even more privacy, there are 24 furnished cottages available, four of which feature large hot tubs. The State Park features a two-mile boardwalk and several hiking trails. Try the “wine trail” featuring local wineries where you can attend tastings or an evening show. When the snow falls, you’ll see a new side of the park by hopping on the three-mile skiing trail (rentals are available from the front desk). Don’t you wish every dinner could start with an aromatherapy jacuzzi bath; accented by a warm fireplace in a cozy cottage? The Inn & Spa at Cedar Falls in Hocking Hills sets the stage for a relaxing weekend, secluded in the still woods of southern Ohio. Visit Ash Cave and Old Man’s Cave where frozen waterfalls dazzle among the breathtaking landscape. Retreat to the lodge for a seasonally selected menu at the Kindred Spirits Restaurant or sip their delicately crafted cocktails. Bird in Hand, through Feb. 24 —Become one with nature at Beech Creek Gardens’ annual Bird in Hand in Alliance. Explore the outdoors and hand-feed wild chickadees. Your little ones will love the “Play-viary” filled with a variety of both fun and educational activities, and all can enjoy an outdoor fire, hot cocoa and roasting marshmallows! Comfort Food Cruise, Jan. 19-20, 26-27 —Trek through exquisite Hocking Hills scenery while sampling all your favorite comfort foods at twelve different area restaurants. Don’t feel guilty indulging, as $5 from each ticket will be donated to local food pantries and you can burn off calories hiking or walking on trails past frozen waterfalls. Martin Luther King, Jr. Day Weekend, Jan. 19-21 — Celebrate Dr. King’s legacy with Martin Luther King, Jr. Day Weekend at the Ohio History Center in Columbus. Kick off this three-day event with a visit to the art exhibit, Black Heritage Through Visual Rhythms, open now through January 21. Delve deeper into the exhibit and its meaning through Art + Activism = Social Consciousness, and don’t miss the film screening of the biopic Blooms for Real: The Late Teenage Years of Jean-Michel Basquiat, both available all weekend. Chocolate Meltdown, Jan. 19 — Get ready for all-things chocolate at Chocolate Meltdown! Presented by the Miami Art Museum, this sweet event features dozens of yummy vendors, an amateur baking contest, auction and raffle, art exhibit and plenty of activities for the whole family. Lebanon Antique Show and Sale, Jan. 26-27 — Browse more than 50 vendors of high-quality antiques from the 18th-20th centuries at the Lebanon Antique Show and Sale. The longest running antique show in Ohio, this event features novelty items such as furnishings, decorative arts, textiles and jewelry. Find one-of-a-kind items and enjoy delicious food throughout the weekend. Buckeye Lake Winterfest, Jan. 26-27 — The festivities begin at dawn for Buckeye Lake Winterfest, where Benny the Bass will predict when spring will arrive! Bars and restaurants will offer specials, with plenty of activities all day long, including fireworks. Family Day at Snow Trails, Feb. 3 — Bundle up and enjoy discounted family fun at Snow Trails in Mansfield! Catch a ride on the ski lift, try your hand at skiing, or snow tube with the entire family. Save on everything from group lessons to rentals at this all-day event. WinterFest, Fe. 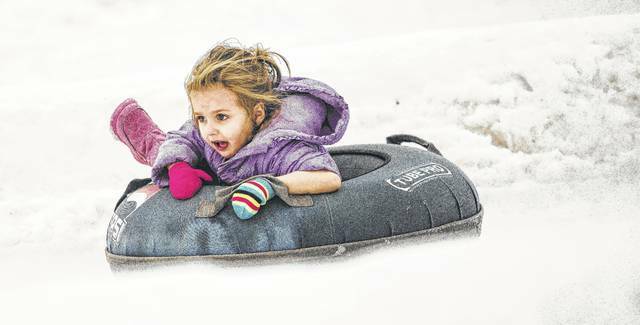 8-9 — Both you and your little ones will enjoy Bowling Green’s annual WinterFest. Featuring everything from an ice garden and carving demos to a Winter Market, live entertainment, snacks and carriage rides – you won’t want to miss this. Get ready for a great two days of festivities!